Slow Sunday mornings make me happy. I love having time on the weekend to potter around the kitchen in my PJs and bake. Especially when what I am baking is scones and there is coffee brewing to enjoy them with. I made this batch of scones while I was staying with my parents. I can’t comment on how they keep, or what they are like cooled because they disappeared pretty fast. This recipe has less butter than most and is kept moist and sweet with yoghurt and apple sauce. 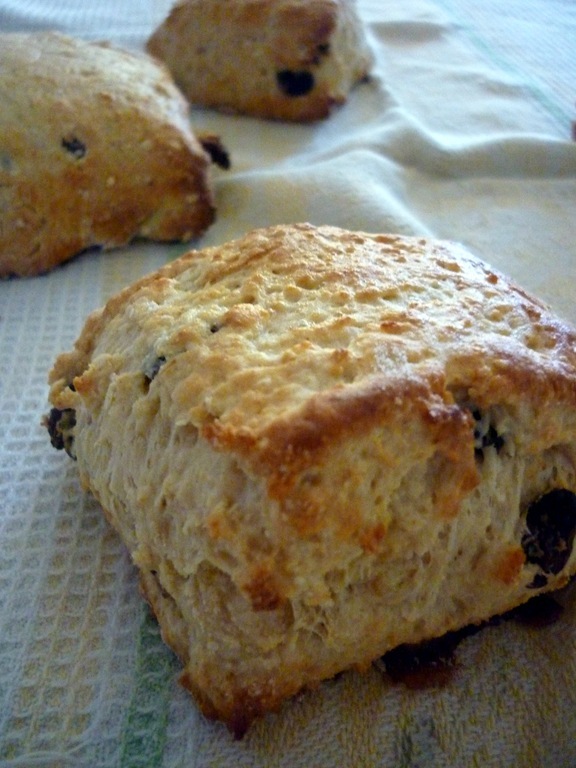 It is also pretty forgiving so is a great one to try if your scones usually resemble something more akin to rocks. I had my scones with a little margarine and a lot of jam. Yum! The novelty of air travel has completely worn off. I used to enjoy the suspense of waiting on the tarmac to take off, the excitement of leaving the earth and watching other people on the plane. Today, the whole process felt more like torture. This was not helped by the two young children who screamed the entire duration of the flight, the man beside me who hogged the armrest or that everyone around me seemed to have a cold or flu. Thankfully, I had a good breakfast with me to help brighten my day. 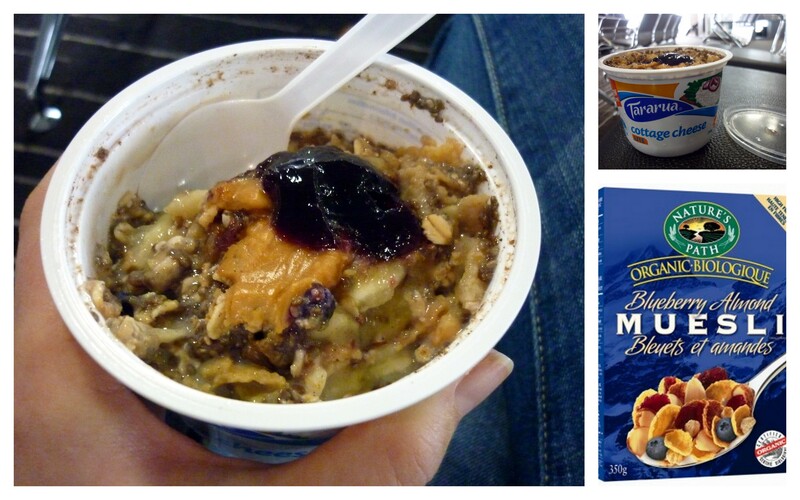 Airports aren’t exactly renowned for their healthy food options so I usually bring my own. This breakfast mix looks kind of like pet food but was the perfect portable meal. I prepared the mix last night so all I had to do was grab it out of the fridge as I walked out the door. I used an old cottage cheese container so I could just toss the it in the bin when I was finished, saving on precious baggage space. This mixture was a mix of Nature’s Path Blueberry Almond Muesli, milk, chia seeds, banana, cinnamon and sultanas. Because it is left over night, the mixture is soft, creamy and very moreish. What made this really special, was the peanut butter and jam on top. Mm! I’d make this again at home even if I didn’t need a breakfast on the go. I promise I didn’t try to alliterate that title! I took ages to decide what I felt like for breakfast this morning. It was too sunny outside for oatmeal and I couldn’t be bothered messing around with pancakes. Then, I remembered a recipe I’d tried a while ago by Ashley from The Edible Perspective for Buckwheat Bakes. I’ve tried making these before and they are fantastic. You can cook them in one large ramekin or in individual muffin holes. I prefer to make three individual bakes so you get more of the crunchy outside and can fit more topping on! Their texture is close a muffin’s bit a bit more dense and the buckwheat give it a yummy nutty taste. If you haven’t tried chia seeds before – give them a go. Their taste is unnoticeable in baked goods and they are a good source of fibre, protein, omega-3, magnesium and potassium. Ashley’s recipe makes a rather substantial sized meal so I cut the recipe down a little because I didn’t want to be weighed down before the gym. I was also out of buckwheat groats and not worried about making the recipe vegan so used an egg white and cows milk. There’s no added sugar or fat but you wouldn’t guess it from the taste. If you like things a bit sweeter or were having the bake without toppings, as suggested by Ashley, you could add one or two teaspoons of sugar/honey/maple syrup etc. 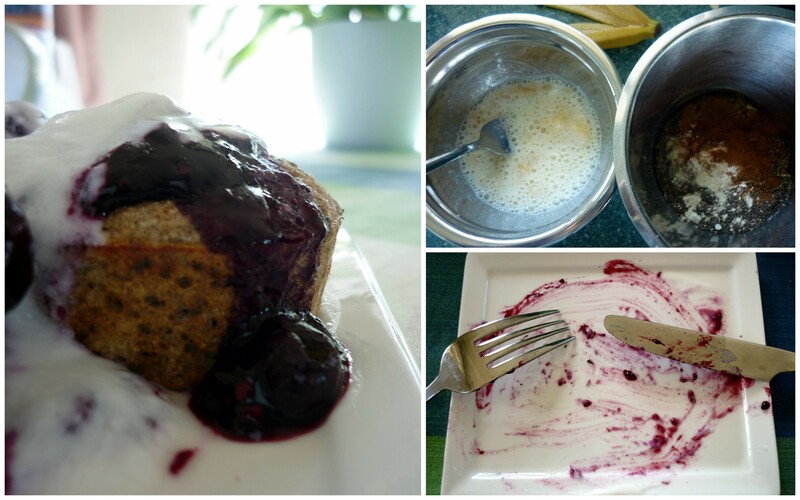 I didn’t worry about doing this because mine were smothered in Simple Berry Sauce and yoghurt – a great start to the day. 2. Mix wet ingredients (including the banana) until there are only a few clumps. 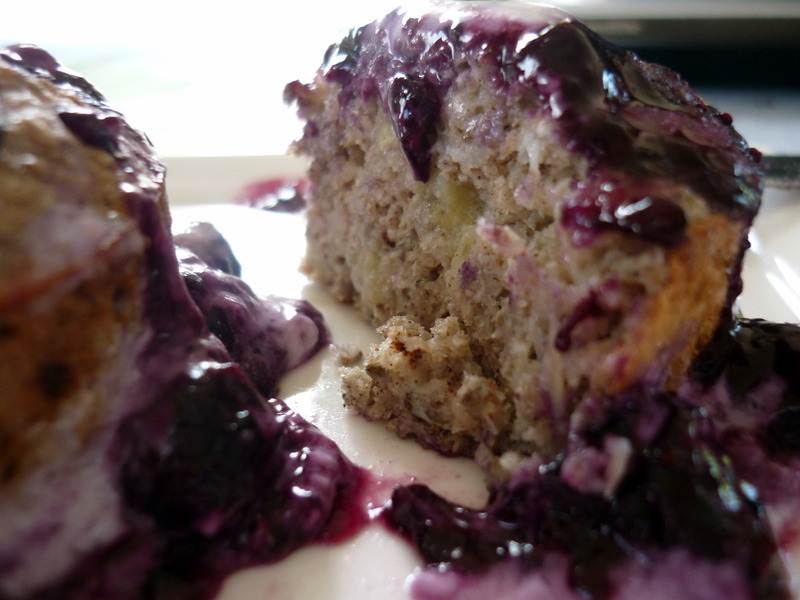 I quite like hitting the odd bit of banana in my bakes so you don’t need to be too fussy. 3. Pour into a greased ramekin or muffin holes. 4. Bake until the breakfast bake bounces back and is golden at the edges.